Yay for fall fashion. I love this time of year when I get to pack away flip flops and swimsuits and bring out cozy sweaters. But it’s too easy to use fall as a time to hide under big, bulky layers. Here are 5 fall must haves for the curvy crowd. Brightly colored pants everywhere! But I recently tried on a pair of red skinnies and I’ll need my legs to grow another foot or so before venturing out in those. Fortunately, options (like these red pants) exist for those of us with hips. Skip cropped or tapered styles and stick with flared or wide leg. Balance the bold color with a neutral top (like gray or navy) and add height with heels. Pretty pleats are making a lady-like comeback. I love the easy elegance of this cobalt dress that can go casual or more glam for the holidays. 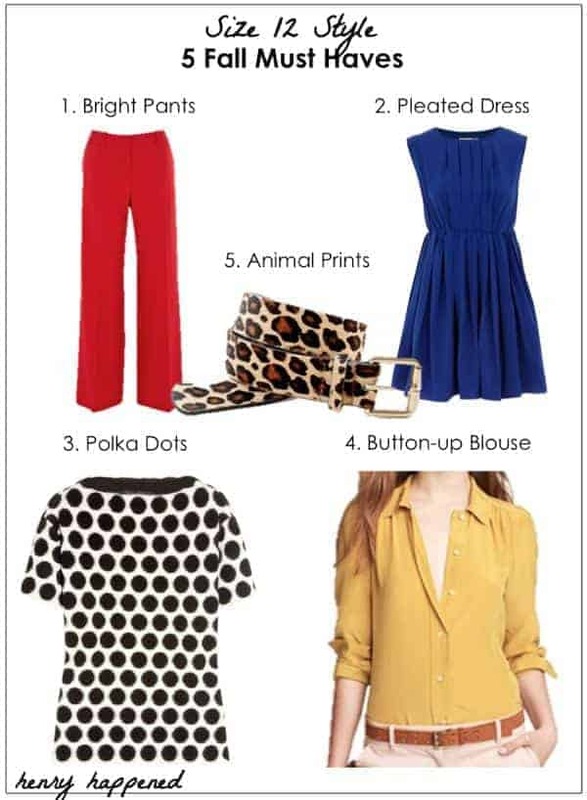 I’m so happy about this trend – not just because I already have 3 polka dot shirts – but because it’s such a cheerful print. So much more fun than boring black. Splurge on a shell and add color with cardigans or jackets. I’m generally not a fan of anything that needs to be tucked in but silky blouses look great paired with a tweedy jacket. Look for small prints or solids to not overwhelm your shape. So pretty and feminine with work pants or dark jeans. Take your pick – leopard, cheetah, snakeskin. Just remember that a little of this print goes a long way. Use it to draw attention to specific areas, like a great belt at your waist. Bonus purchase: Sequins! There’s no point in being boring! I love the pleated dresses and the polka dots! Bright pants are at the top of my list too!! I saw a beautiful pleated dress at Kohl's yesterday. Realy loved the look. If it wasn't 45 bucks I would have made it mine! Would you believe Steph that just yesterday I pinned that spicy gold J Crew blouse to one of my Pinterest boards! I totally agree with you! While I luckily have some of these things already, I definitely still need some bright jeans! I really love that trend! Have to say, love pretty pleats and cobalt is always a winner. That pleated dress is beautiful AND it's my happy color! What a great post and tips. Loving those red flare pants. Ahhh…be still my heart! I am totally into cobalt blue lately and that dress is so pretty! It would look great with a belt or even a blazer for work. So pinning that! Great collection Stephanie and your hair color will look terrific with those red pants. I love the polka dots and my daughter loves animal prints. Pleats unfortunately make me look like I have gained weight! I too, can't wait for fall but I do hope it gets cold here in my town. I love the blue dress and the leopard belt will go perfectly with it. I am all for the button up shirt! Especially the ones with the neckties! LOVE! You could totally rock any of them, just so you know! I love the look of bright pants–I must get some this season!